Summer is here and with Memorial Day being tomorrow I know there’s going to be a lot of grilling going on. I don’t have to work tomorrow so I’m sure we’ll be grilling out as well. I love when it gets warm enough outside to grill almost every day. Food is more flavorful, there’s less clean up, and we enjoy having people over for cookouts. 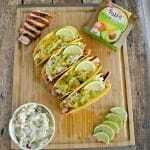 Smithfield® Marinated Fresh Pork is great for Memorial Day and other summer gatherings because it’s slow marinated and perfectly seasoned in the bag so all I have to do is heat up the grill! The less preparation I have to do ahead of time the better. Who wants to spend a lot of time in a hot kitchen during the summer? I want to be out on the porch with my friends while the pork is on the grill. The great thing about our summertime parties and cookouts is that my husband mans the grill while I take care of the side dishes. It’s nice to have him watching and cooking the entree and the guys always like being outside around the grill with him. With Smithfield Marinated Fresh Pork we can enjoy Real Flavor, Real Fast so we spend more time with our friends and less time preparing the meal. When I was preparing for our Memorial Day cookout I headed over to Food Lion to buy everything I needed. I purchased two Smithfield Pork Tenderloins to cook on the grill. We like Smithfield Marinated Fresh Pork because it’s made from 100% fresh pork and has no artificial ingredients, so I feel good about serving it to all of our guests. 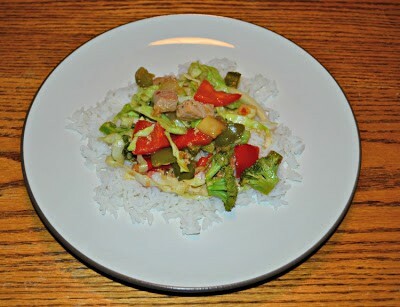 Right now you can visit the Food Lion coupon page and get a $1.00 coupon for Smithfield Marinated Fresh Pork. So what did we end up making? We cooked the Smithfield Roasted Garlic & Herb Marinated Fresh Pork Tenderloin and then sliced it up to make sliders. I used the Smithfield Roasted Garlic & Cracked Black Peppercorn Marinated Fresh Pork Tenderloin to make my Grilled Pork Nachos. 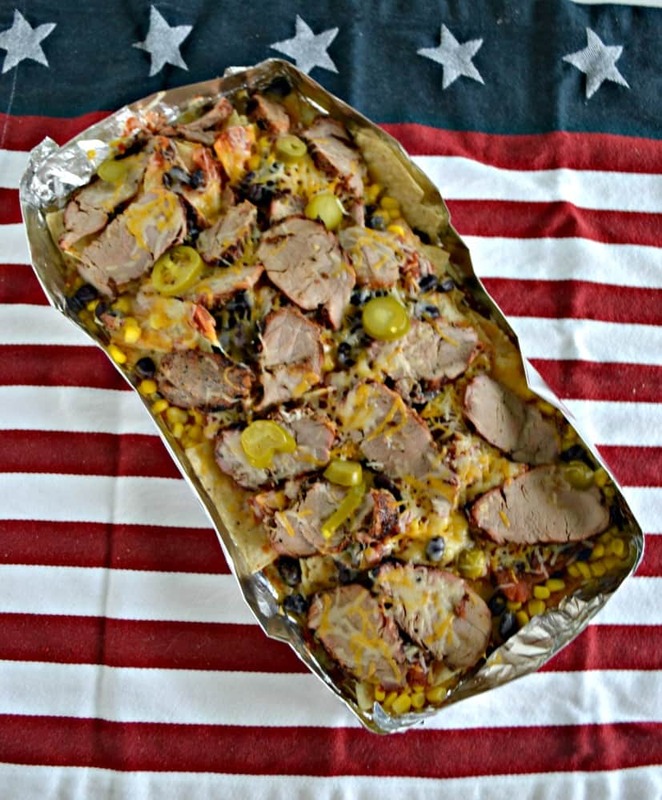 Not only is the pork tenderloin grilled but the entire nachos dish is grilled as well. This is an awesome recipe for big parties because it makes a ton and it’s grilled in foil so clean up is minimal. 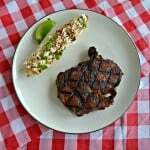 I had my husband throw the pork tenderloins on the grill while I prepared the nachos. The first thing I had to do was make a foil container to hold them. I simply doubled up on the foil, folded it up, and made sides to hold everything. I then loaded the foil up with tortilla chips and invited my friends to add on all the toppings they wanted. We decided on corn kernels, black beans, salsa, jalapenos, and a Mexican cheese blend. When the pork came off the grill I sliced it thin and put it over top of the nachos. I sprinkled on a little more cheese and then put the entire thing on the grill to heat up the toppings and melt the cheese. Pro Tip: Pull the pork tenderloin off at 150 degrees and then slice. Since I put the sliced pork on top of the nachos and put it on the grill for an additional 5 minutes it quickly comes up to temperature but won’t dry out. The Grilled Pork Nachos were delicious! The pork was grilled to perfection and the cheese was melted and gooey. I didn’t even have to put them on a plate. I simply set the foil package on a cutting board and set them out for everyone to snack on. They were gone within a matter a minutes! 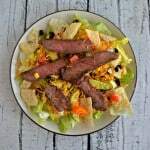 This is a delicious and easy recipe that will be great at any summer gathering or cookout and it’s ready in just 30 minutes! Speaking of 30 minutes, make sure you head over to the Smithfield Real Flavor Real Fast website and enter the “What Can you do with 30?” sweepstakes! All you need to do is submit a tip for getting dinner on the table in 30 minutes or less and you can try for a chance to win a trip to Napa Valley. Make a delicious meal using grilled Smithfield Marinated Fresh Pork Tenderloin over top of tortilla chips and all of your favorite nacho toppings! Heat a gas grill to medium heat. 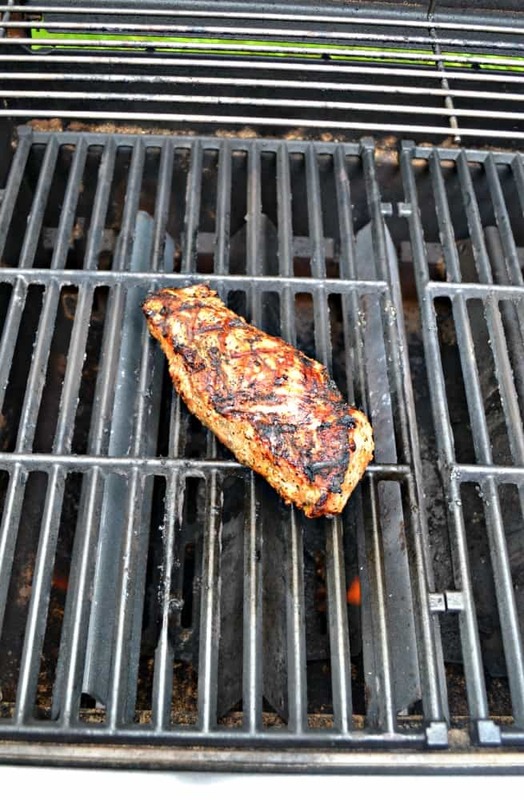 Place the pork tenderloin on the grill and cook for 10-12 minutes per side or until the internal temperature reads 150 degrees. Meanwhile, place two large pieces of foil on the kitchen counter. Fold all four sides in one inch. Then fold each of the long sides up two inches so that they are standing up. Turn up the other two sides two inches and then crimp the corners to seal. Place the foil packet on a cutting board. Load up the foil package with the tortilla chips. Sprinkle with the corn, black beans, salsa, and one cup of cheese. Once the pork comes off the grill slice it thinly. 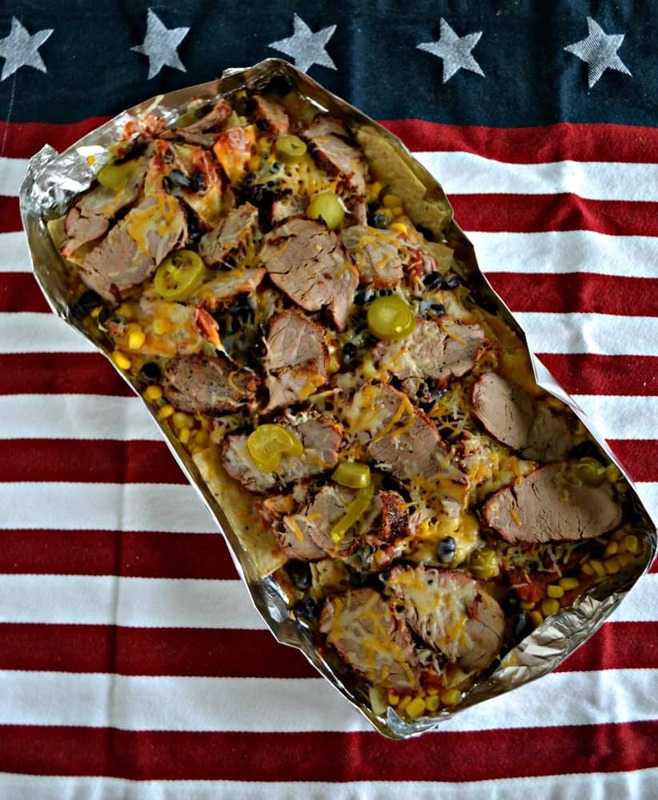 Place the thinly sliced pork on top of the nachos. Sprinkle with remaining cheese and the jalapenos. Place the foil packet on the grill and cook for 5 minutes. 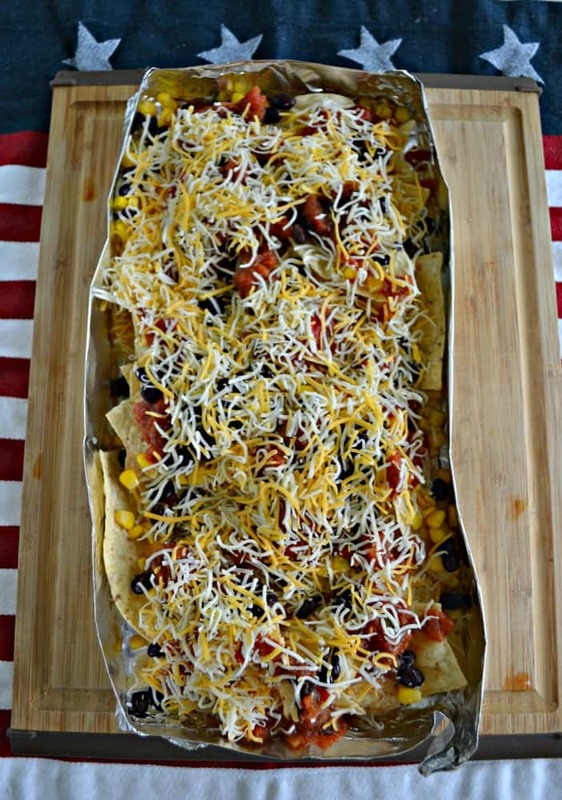 Remove from the grill and place the package of nachos on a cutting board. Serve immediately with sour cream and guacamole if desired. 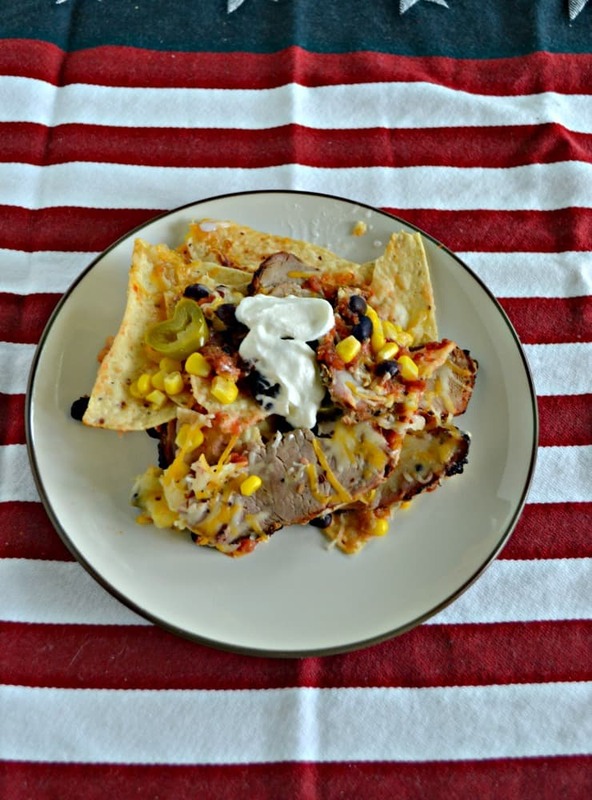 The fact that these nachos are made with grilled pork, I bet they are even more delicious!